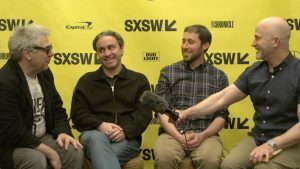 I met with director Jeremy Workman (Magical Universe) and his documentary subject, Matt Green, on Sunday, March 13, at the 2018 SXSW Film Festival, with my Fog of Truth podcast colleague Bart Weiss (of Dallas VideoFest) joining me for the conversation (in fact, we used this interview in the first episode–201–of our 2nd season, available on iTunes, SoundCloud and Stitcher), to discuss their collaboration on the feature-length The World Before Your Feet (which I also reviewed). 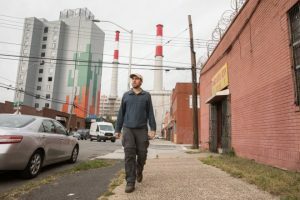 In the movie, Green is in the middle of walking every street block (and attendant parkland) in the five boroughs of New York City, a project that will ultimately, if/when he completes it, cover over 8,000 miles (you can keep track of Green’s progress on his blog). Green is able to afford the project by living cheaply, staying either in friends’ apartments or the apartments of people for whom he house-sits/cat-sits/dog-sits. More than just a travelogue, the film takes us on a journey as metaphysical as it is geographic, probing the history of both the urban space and the human soul. Here is a condensed digest of our conversation, edited for length and clarity. Hammer to Nail: So, Jeremy, how did you find Matt and decide to make a movie about him? Jeremy Workman: I’d actually known Matt for nearly a decade. We’ve been friends for a long time. He had been doing a lot of great walking adventures – he walked across the country – and it was something where I was on his blog, and I would meet with him and hang out, and hear about all these amazing adventures that he had that were very different from what I expected them to be when he said he was just walking around. When he walked across the country, I followed that blog quite fervently, and I was really just taken by what he was doing. It was not walking to see something amazing: it was just about the experience of going out in your world and meeting people and experiencing what is just right in front of you in this really interesting way. 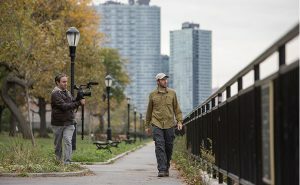 So, when Matt then announced the was doing this walk of every street in New York City, I was instantly intrigued, but it took me a while to go to him and say, “Why don’t I film this?” I live in New York, and was finishing up another film that was about to be released, so I sort of had some down time. I wasn’t really thinking that this would be a film, but I reached out to Matt and said, “Hey, do you mind if I come along and film?” And I knew it was going to be a little bit of a tough sell – you know, Matt isn’t someone who wants a big crew behind him – but he agreed, and we just started to shoot a lot. HtN: And it was just you. You were the crew. JW: Exactly! Part of my pitch to Matt was: “Hey, it’ll just be me. It’ll be me, with a camera. No assistant cameraman, no other cinematographers. I’ll put a wireless mic on you, and I’ll follow you into New York City and I won’t intrude on what you’re doing and will just be a fly on the wall and walk with you. Obviously, when you bring a camera into an equation, it can really change how people react in the real world, so I really wanted to keep that as light as we could. So, just me! HtN: (turning to Matt Green) So, did you have any hesitation? What was your reaction when Jeremy pitched this to you? Matt Green: I was definitely a little bit hesitant. A couple people prior to him, whom I didn’t know, had asked about doing something similar, and I was never really comfortable with that. I just didn’t know what it would be like, and what their angle was. So, it definitely helped that I was friends with Jeremy and knew that, philosophically, we’d be on the same page of what we might be trying to convey. And I was also, at that point, 2 ½ years or so into the walk, and I had become aware that there was stuff going on, sort of themes to my walk, that I wasn’t capturing at all, in my blog. You know, that’s fine – we don’t all have to broadcast every aspect of everything we’re doing – but I was just kind of getting the feeling that something cool was happening here, and I didn’t know how to convey that people. And having been familiar with Jeremy’s other work, which were, in some ways, similar types of projects, dealing with people really focused on something and how these themes emerged from that that are much broader than the specific thing they’re doing. So, I was excited to see what he could pull out of what was going on, that I wasn’t able to communicate. Bart Weiss: So, Jeremy, since you were walking along with him and seeing this, what did you see? Because the whole purpose of the walk is that you see the world differently when you’re walking black by block: you’re meeting people and you’re in the moment. You’ve been doing this for a long time, so you have a way and a lens through which you look at the world. What did you notice that was different from what Matt was looking at? JW: Well, I was always trying to take my cue from what Matt was doing, so I was – you know, like any documentary filmmaker – trying to let the subject dictate, a little bit. But I came with a lot of preconceptions about what this movie could be, or should be, and I was thinking it could be this tale of New York City, and it would be loud and kinetic and we’d see Radio City and Carnegie Hall and all those things that we’re all used to seeing about New York. But what I quickly found, probably within the first day of shooting, was that this was going to be a very different understanding of both New York and a city, and about looking at the world. Once I realized that, it was easy for me to follow in Matt’s footsteps and understand what we were trying to see, and it was about this simple idea. What Matt’s doing is really simple: he’s just walking in a city. Anyone can do it. It’s not so extraordinary. But what’s extraordinary is that when you do something that’s this simple act, you immediately see what’s kind of wondrous around you, and what’s really interesting around you, in all these different ways, and that was something I was always trying to keep as the focus of the movie. BW: So, since the film has been made, do you find yourself walking out and seeing the world you live in – or here in Austin – in a different way? JW: Yeah. Spending any time walking with Matt, and I hope even spending time now watching the movie, people’s minds are going to start triggering and have all these new thoughts, just when they go outside or anywhere they are … it doesn’t have to be a big city, it doesn’t have to be some historical point of reference … just going out and experiencing the world in this very sort of immediate way, where you’re focused and willing to take it in, is something very powerful. It was certainly something that has changed me, in terms of how I see the world, and I’m hoping that when people see the film, they react in that way, too. HtN: Sure! So, Matt, you’ve been doing this since…2012? Or did you start at the end of 2011…? MG: I started with a few hours left in 2011. New Year’s Eve. HtN: And in what year did Jeremy start filming you? MG: We both can remember the day, because it was September 11, 2014. I remember, we walked by a house, and you could see the memorial service playing on somebody’s TV. HtN: (turning to Jeremy) And then, how long did you actually film Matt? JW: We were filming up until 3 weeks ago. JW: Yeah! Literally, three weeks ago was the last thing we shot, and it’s in the movie. A lot of people are furiously racing to finish their movie for SXSW, or other festivals…we were shooting three weeks ago. HtN: That’s…amazing. So…let me just ask…(turning to Matt) I was leading up to this question, which is: how was the experience of being followed by Jeremy different for you than just doing it on your own, other than the fact that you had this guy following you. Did it change your perception of what you were doing? MG: Yeah, I mean, you know, it didn’t take all that long to get used to the idea that he was there and start to forget about it. So that was good. But…(laughs)…one thing that was nice about it was that if I just had some kind of weird thought pop into my head, I could just turn around and say it somebody, whereas before I would just kind of say it to myself. MG: Exactly! And we’re all crazy! MG: (sotto voce) Thank you! Jeremy Workman, filming Matt Green walking. BW: There are lot of those in the south, by the way, because a lot of Jews left. That’s not just a New York phenomenon. But anyway, it gave an opportunity for you to give voice to all these things that you have been doing, and when you’re out there by yourself, you don’t get to tell anybody, except on your blog. So, we, as the audience, get to experience what you’re experiencing, which really makes it resonate more deeply. HtN: I agree! And I just want to point out that if you don’t have a filmmaker following you, you can get a dog, which is what I do, so when I’m talking to myself as I walk, I have a reason to do so. JW: It was great for me, because…well, first of all, Matt, as you see in the film, is very knowledgeable about pretty much anything, So, having that, as a host, for the film, is really great, because he could really just go into any direction. And he’s also funny! So…that helps, too! HtN: You are! And let me just add, speaking of dogs, since you obviously have plenty of experience dog-sitting and cat-sitting, some of my favorite moments in the film are of you interacting with charges, whether they’re cats or dogs, and…(turning to Jeremy)…I am so happy that you included those in the film. BW: It’s a beautiful montage. HtN: It really is, and you are funny. BW: So, let me ask you about this system of walking. As you look at the maps, you can see that you don’t just hit a neighborhood and then hit everything in that neighborhood. You’re kind of doing a little bit here, and then the next day, you’re completely over there. Why? It would seem to me, if I were tasking this out, I would say, “Let’s just do all of Bensonhurst.” It just seems, in some sense, completely haphazard, but I’m sure there’s a deeper resonance for why that works. MG: Sure. I mean, it’s primarily a practical thing, which is that, since I don’t have an apartment, I’m staying in different places all the time, so I might as well walk whatever’s close to where I’m staying. So, that was kind of the initial thing: wherever I was, I’d just walk out the door and start going from there. And then, eventually, all the areas where I knew people started filling in, and now I have to travel to get to places. But I’m still going someplace that is relatively convenient to walk. And as far as the actual shapes of the routes go, I know they look very weird, but those are actually pretty strategic. It seems, from one perspective, that starting in one neighborhood and doing everything in one neighborhood would be the easiest or the most efficient, but it’s really not, because you end up kind of covering the same area. You have to re-walk more blocks to do that, and you end up…the only thing that really matters is trying to leave as many unwalked areas that are connected together as possible. So, it doesn’t matter if they’re near each other, as long as you can connect them with streets, so you don’t end up with little patches, here and there, that are unwalked. So, it looks totally insane, but if you think of this as a jigsaw puzzle, it kind of makes sense, because it’s weird shapes that fit together. JW: And it was also great for the film. Here Matt is just doing this sort of random take on New York City, so it also meant that he could be anywhere, at any point in the movie, and it’s organic to how he normally does it. It also allows for this incredible diversity to come out. MG: He could come out with me two days in the week, and I’d be in totally different areas. MG: And then, also, even within one walk, because even within one single day, we could be in vastly different-feeling places. HtN: (to Jeremy) Let me ask a question about camera technology, since you were filming for long enough that … in today’s world, cameras change every day … did you have to adjust what you were shooting on? What did you shoot on? JW: I was making some decisions early on, like “I’m not going to shoot 4K,” and “I need to be in a situation where I can shoot this easily.” Even though it’s a guy walking through the streets of New York City, it was very challenging for camera, just in terms of focus, and coverage and noise and…focus being the biggest issue. Exposure, too. So, there were a lot of technical challenges. I shot with a Canon C300, and also a Canon C100. At first, I was definitely trying to do what a lot of cinematographers do, bringing in a lot of prime lenses and make it look really beautiful, and then I realized that was going to get more and more challenging, so I brought in…this is pretty geeky…a Canon L-series zoom, which allowed me to have really great-looking shots, but be able to zoom in and out of wherever Matt was, and I just sort of lived with that approach, and it really worked, because, since Matt was amongst the city, I really wanted Matt to always feel a a part of it. I didn’t want to single him out, in a way, with some sort of long-lens approach. JW: (laughs) I’ll give you another rule that you’ll appreciate, then. I wanted to have drones, because I wanted to show Matt within the city, right? So, we were obviously figuring out ways to do that. (turning to Bart) And I’m with you on this: drones are in every documentary and people now buy the drone footage as stock footage and just drop it in. I said, “If we’re going to do drones, they have to feature Matt in the shot.” So, it suddenly created this incredibly new challenge, where it wasn’t just a shot hovering over Manhattan; it has to start with Matt. It has to feature Matt in the drone shot, and that puts a different spin on it than just using drones as overhead shots. BW: I want to talk about the shots of…where was that space? BW: The panorama. It’s very important to give a sense of the context of the city, but I think the choice of shooting that there, and the way you shot it, showed the neighborhoods in a really effective way. HtN: The Panorama of the City of New York. HtN: Will you get any residuals? Will you see any of that? MG: He said 18 million. JW: So, I realized that there was this incredible thing that Matt talks about in the movie, which was this three-dimensional map. And I was like, “Oh, that’s the perfect idea here.” Here’s this model of the city, and we would be able to use it, in a way, and add graphics to it. So, we got permission from the Queens Museum, and I shot it with a technocrane. The Queens Museum knew Matt. They knew about Matt and his blog, and they basically invited us to do it. HtN: Excellent. It really does help contextualize, and I think your film, overall, does a great job of both presenting the City of New York and Matt’s quest. Congratulations on the film. It’s really amazing. Thank you so much! JW: Thanks for talking to us!